In today’s highly digitized world, everything you need is on your phone or device. A lot of the data we have on our phones and devices is really important to the day to day running of our lives. When we talk about phone data, phone transfer software is so indispensable in today’s world. This type of software will help you backup the data you have on your phone to your computer so you always have a copy in case of any loss. Phone transfer software also comes in handy when you need to transfer all your data, be it to transfer Android to iPhone, Android to Android transfer, etc. Typically people need to do this when they purchase a new phone, and would like to transfer music from iPhone to iPhone, transfer contacts from iPhone to Android, etc. 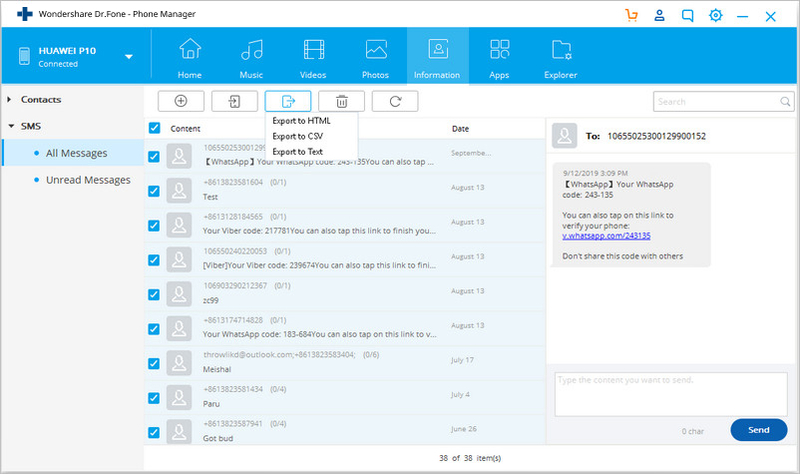 In this artilce, we will introduce top 9 Phone Transfer software. Check them and you will know how to transfer data from Android to iPhone and other transfer methods easily. dr.fone - Switch is a powerful phone data transfer software. It allows you to transfer all kinds of phone data from one mobile phone to another with the same easy operation, including transferring contacts, videos, music, photos, calendar etc. When you are wondering how to transfer contacts from Android to iPhone, or how to transfer apps from iPhone to iPhone, dr.fone - Switch is a nice choice. Transfer Everything from Phone to Phone in 1 Click! Easily transfer photos, videos, calendar, contacts, messages and music from Android to iPhone (and vice versa). Enable to transfer from HTC, Samsung, Nokia, Motorola and more to iPhone XS (Max) / iPhone XR/ X/8/7S/7/6S/6 (Plus)/5s/5c/5/4S/4/3GS. Supports devices of major carriers like AT&T, Verizon, Sprint and T-Mobile. 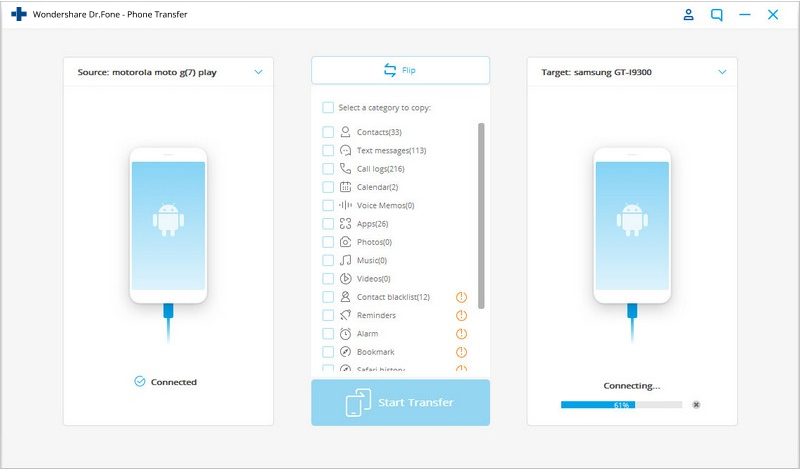 This tool can effectively connect to Android devices to transfer contacts from Android to Android. This is not enough. Data types like text messages, calendars, call logs, photos, music, and even apps are transferrable between Android and Android. In-depth guide: How to Transfer Contacts from Android to Android Devices? How to transfer music or messages from iPhone to iPhone? A piece of cake for dr.fone -Switch. 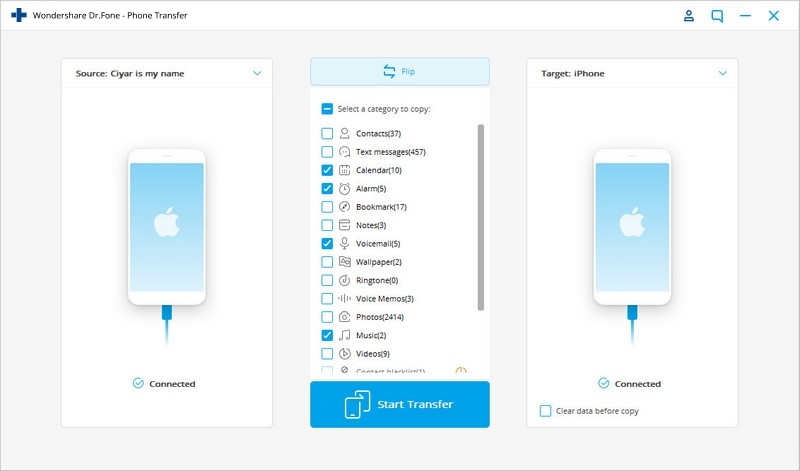 Seen from the following screen, this tool can transfer many types of data from old iPhone to iPhone XS (Max) / iPhone XR with few clicks. 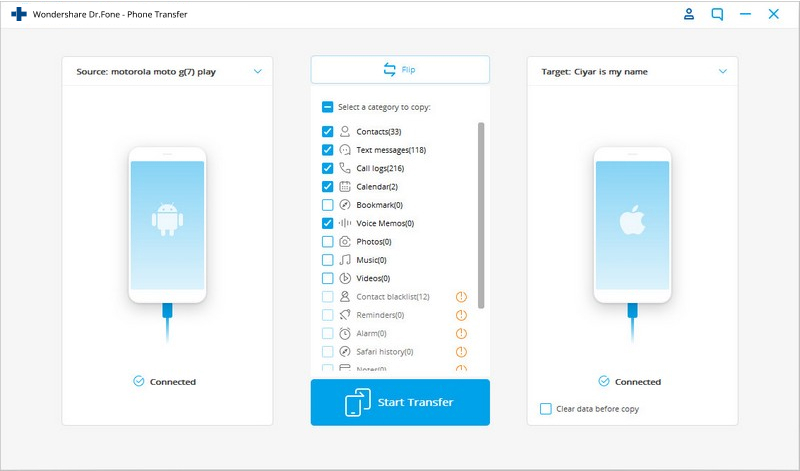 Providing cross-platform operability, this tool allows you to easily transfer data from Android to iPhone XS (Max) / iPhone XR, as well as transfer data from iPhone to Android. You can click on "Flip" to swap the destination and source devices. 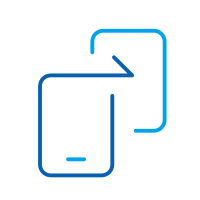 MOBILedit Phone Copier is used by millions of people for the purpose of transferring phone content and managing it by other devices. This is a great phone copying software which will migrate all of the data from your phone into a new phone or PC. You may control and manage your phone desktop from the comfort of your PC. Transfer files from one phone to another. Manage your Internet storage account. Optimize phone contents with single touch. It can be used to transfer data from iOS to Android, Android to iOS, iOS to iOS and Android to Android. It also works on Android including Android 5.0 and iOS including iOS 9.0 devices. It is easy to use and works with most phones including Apple, HTC, Sony, LG, Motorola, Nokia, Blackberry and Samsung. Some of the phones supported on this software include iPhone, Sony, Motorola, LG, Nokia, Samsung and Blackberry devices. dr.fone - Transfer (iOS) gives you the power to transfer music, videos, photos and contacts fron one iPhone/iPod/iPad to PC easily. Besides, it lets you transfer playlists, songs, videos, iTunes, podcasts to/from your iPhone, iPod and iPad. You may load your iDevice with music and video which are not compatible with iTunes. The software is fully compatible with iOS 12. Directly transfer music, videos, contacts and photos between Apple devices. Transfer audio and video from iDevice to iTunes and PC. Import and convert music and video to iDevice friendly formats. Save iPhone MMS, SMS and iMessages as XML/TXT/HTML formats. With this tool, you can transfer photos from iPhone XS (Max) / iPhone XR to PC in seconds. Simply launch dr.fone - Transfer (iOS), select "Transfer" > "Photos". Then you can select multiple items and choose Export icon > "Export to PC" to transfer pictures from iPhone to PC. In-depth guide: How to Transfer Photos from iPhone to Computer? Following the similar steps, you can transfer video from iPhone to PC, as well as from PC to iPhone XS (Max) / iPhone XR. 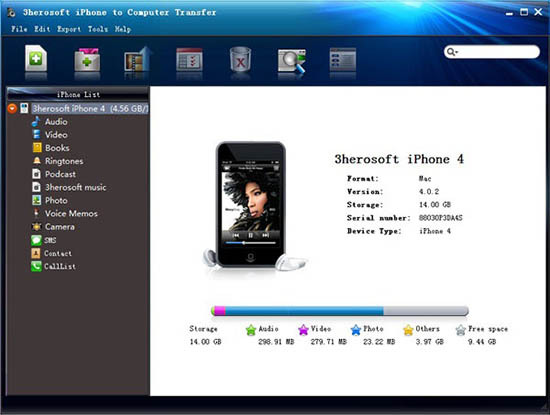 With the PhoneTrans software you can easily transfer music, photos, apps, movies and videos from your iPhone to your computer. It is easy to use and available on both the Mac and Windows platforms. You can also transfer all of the data from your computer to your iPhone. With iPhonetoPC you can transfer files from your iPhone to your computer in just one click. You can also back up all your files including contacts and call logs to your computer so you can easily restore them later. It is also compatible with iPad and iPod. dr.fone - Transfer (Android) is a wonderful software for every Android phone. No matter you want to transfer phone data from PC to Android, or from Android to PC. 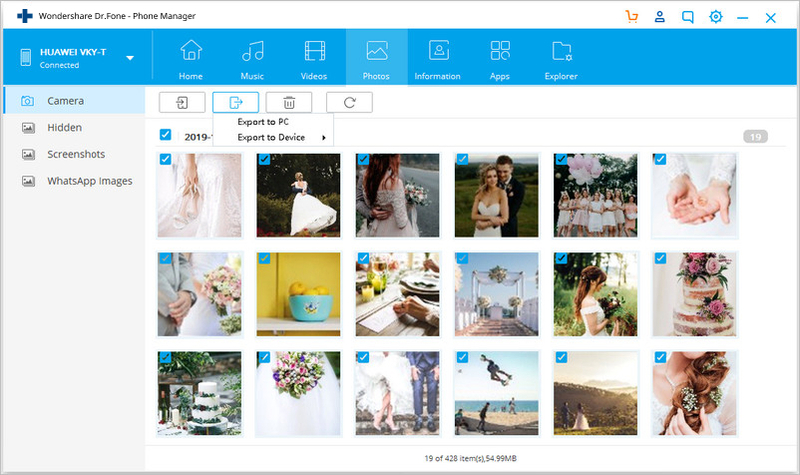 You may also manage your phone files using this software intuitively. Transfer music, videos and photos to/from your Android device. Transfer and edit contacts by PC keyboard. Export and backup messages on Android phone to computer. Organize your apps with this software. Manage phone calls on computer. Launch dr.fone - Transfer (Android), select "Transfer", and choose a tab. You can transfer files from Android to PC or the other way around. To transfer photos from Android to PC can never been easiler with dr.fone - Transfer (Android). Just view all the Android photos from your PC, and select any of them to export to PC. The transfer can be complete within seconds. In-depth guide: How to Transfer Photos from Android to Computer? 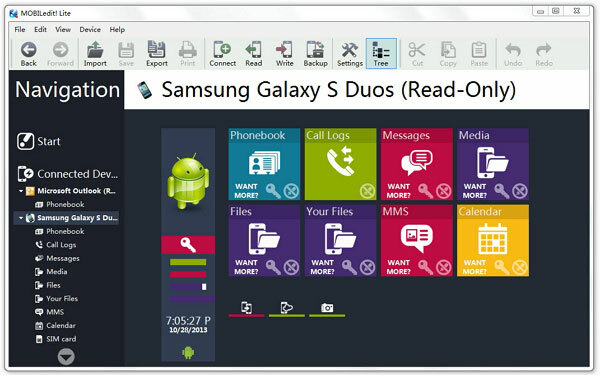 This software is available as an android App as well as a Windows PC client. It allows the user to backup and restore files on their android device. You can also transfer data from android to android. You can transfer Audio, Video, contacts, messages and even call logs. It supports all Android versions including the latest Android 5.0. It supports absolutely all Android devices including Samsung phones, HTC, Sony, LG, Motorola and many others. You may want to use the official transfer software for your particular branded phone. Let us look at each and where you can find them. 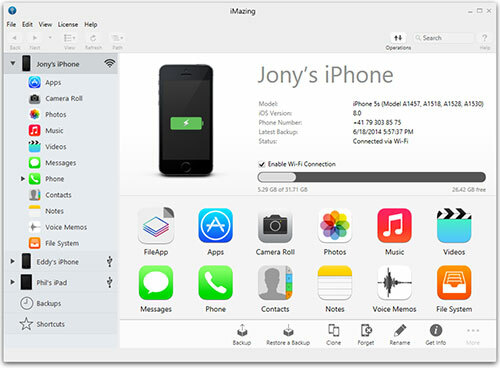 The iMazing software allows you to transfer data including all media and settings to your iPhone. The software allows you to easily transfer all the data from your iPhone to a new device. 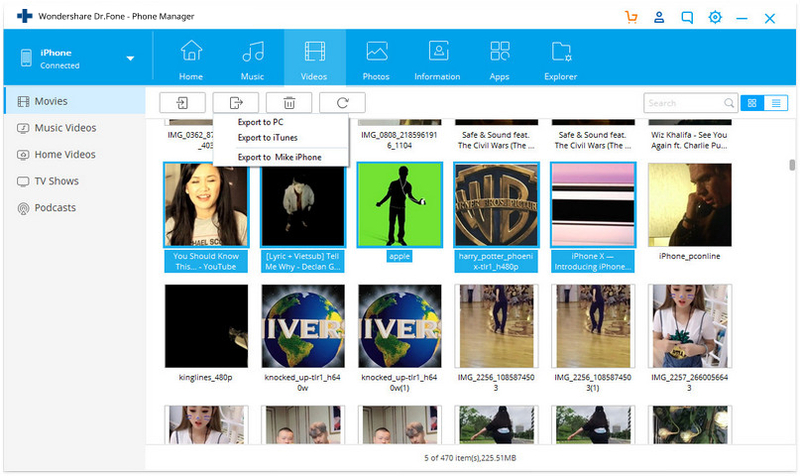 You can also create full backups including media and apps as well as restore the entire data all in one click. It works on Mac and Windows computers. It supports iPhone, iPad and iPod. Also known as the HTC sync Manager, this software is provided by HTC for use on all its mobile devices. The software allows you to sync media between your phone and HTC mobile device. 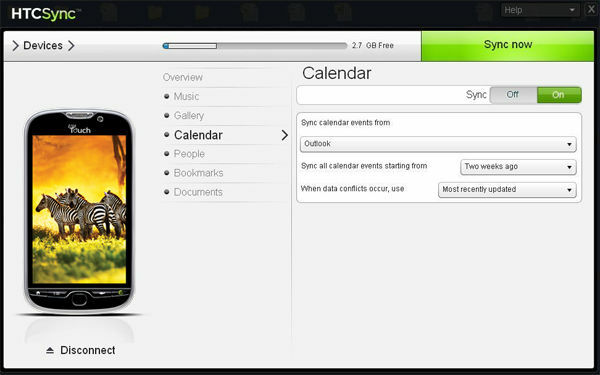 You can also create back-ups of all the data on your HTC phone to your computer and restore later. It works on Windows computers. 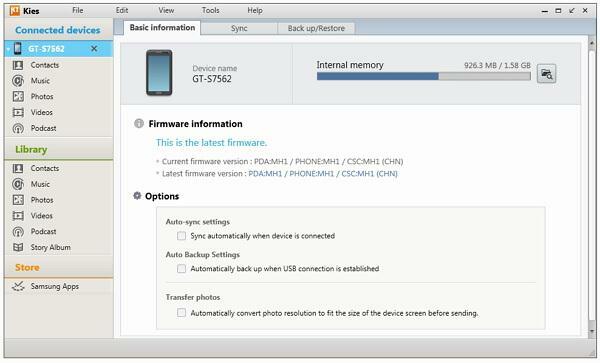 Samsung kies is one of the best phone transfer software which can be used to transfer phone data for example photos, contacts and music from phone to PC. You may connect your phone with your PC or tablet wirelessly and all changes will automatically be done. This software is equally compatible with widows as well as the Mac operating system. 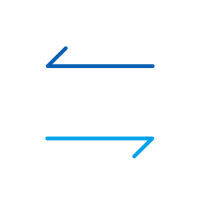 Move data from one Samsung phone to another. Transfer photos, videos and music from device to computer. 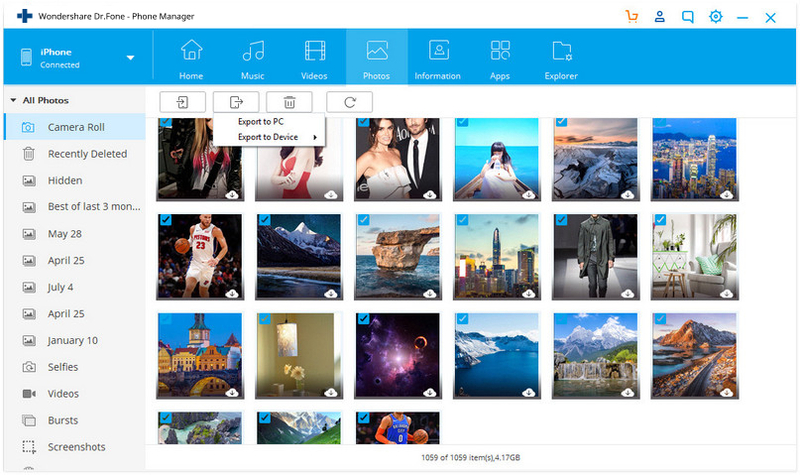 Manage your files like photos, music with the help of this software. Free up extra space by transferring data from your phone to PC. It only can be used to manage your Samsung devices. Hot Samsung devices, lots of devices are not supported. If you own an LG phone then the LG PC suite is what you need to backup and manage your data including your photos, video and music. This software also allows you to easily sync your contacts and backup and restore the files on your LG device. Want to learn how to sync notes from iPhone to Mac? In this informative guide, we have come up with three different solutions to sync notes from iPhone to Mac. The article provides you with 3 solutions to help you transfer music, contacts, videos, photos and more from iPad to Samsung.